To the public, the typical Protestant congregation comes in three basic forms: the small country church, the stone or brick “First Denominational Church” on Main Street or the town square of the county seat, and more recently, the large suburban program-oriented church. Occasionally, we might imagine a church that is larger or more struggling than most, but generally our assumptions about church -- what it looks and acts like -- have long been fixed within a constrained set of expectations. Likewise, for generations, individuals entering pastoral ministry have also assumed that their careers would play out within these same limited boundaries. They would start in a rural congregation, gain experience in a slightly larger one, and conclude at a “First Church” or a large suburban congregation. Although clearly outdated, these stereotypes still have a remarkable hold on our imagination, even in the deployment of clergy. A friend of ours who was developing a network of congregations in a large city realized that he had always assumed that a church comprises a building, a sanctuary and one part-time or full-time pastor. Yet many of the “congregations” he was working with had remarkably different structures and rhythms of gathering. Increasingly, “congregation” cannot be assumed to be associated with a permanent building, a full-time pastor or a denominational brand. Mainline Protestants have failed to attend adequately to these disruptive changes in the church’s patterns of congregating. Ranging from ever-larger worshipping communities -- some even meeting in athletic venues -- to microcommunities, these new forms of gathering are described in various ways. The larger churches are characterized as megachurches, multi-site congregations and at times even incipient denominations (as with the Vineyard communities). The microcommunities are known as New Monastic or emergent communities, house churches, or fresh expressions. Ironically, some of the congregations that began as microcommunities have grown so large as to face many of the same challenges and opportunities that megachurches experience. Yet as different as they are from one another, these microcommunities and megachurches share more in common in their disruptive innovation than either does with mainline congregations. Although these ways of congregating are a disruptive trend in mainline Protestantism, they are not new. Christian history is filled with stories of personal revival and institutional renewal through new patterns of congregating. In the 18th century, John Wesley sought to renew the Church of England through methodical devotional practices and sacramental experience in parish churches. These new practices and experiences took place in a range of settings: bands (most often four people of the same gender and similar spiritual maturity), classes (12 or so people of mixed gender and spiritual maturity) and societies (40 or more people who came together to interpret Scripture, sing hymns, pray and share testimony). All of these groups could be -- and often were -- led by laity. And they proved to be disruptive, as Methodism ultimately separated from Anglicanism in Great Britain and in the United States. 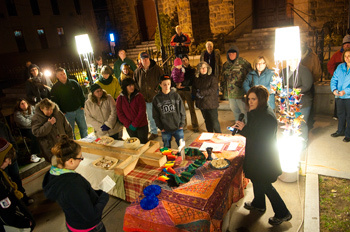 Worshippers gather for Cathedral in the Night, one of the alternative ministries of the Clearstory Collective. History teaches us that innovative movements become, in time, more structured organizations that can often stifle creativity and suppress innovation. As these organizational structures develop and mature, other new and emergent forms of Christian experience begin to arise, some from within established systems and others alongside them. Today, we are witnessing this same disruption among the ossified structures of mainline Protestantism. In our time, megachurches have emerged as an influential new force in Christianity in America and around the world. Many prominent megachurch leaders spent their formative years in traditional denominations; others lead innovative megachurches that do not publicly identify with a denomination. Taking a variety of forms, megachurches include evangelical, Pentecostal and “prosperity” strands that often overlap, and they appeal to both predominantly Anglo and African-American -- as well as, increasingly, Latino and other immigrant -- constituencies. Megachurches are innovative in many ways. Their approach to theological education is more oriented to the laity and more aligned with their own staffing needs. In succession planning, independent megachurches often struggle with transitioning to new leadership, especially after the founding pastor retires. But denominational megachurches, at least those in appointive systems such as the United Methodist Church, still work with bishops on their appointments, yet with much more input and coordination from the congregation. And in missions, many megachurches have strong, sophisticated, professionally staffed programs that have virtually assumed the former role of denominational agencies. At the other extreme, microcommunities are more agile and nimble than the neighborhood church. Because they are not invested in property and personnel, they can channel their resources and energies toward spiritual practices that appeal to both baby boomers and millennials: prayer and contemplation, face-to-face relationships, and community transformation. Interestingly, as Elaine Heath of Southern Methodist University has noted, the New Monastic and emergent movements share many characteristics with the Wesleyan bands, class meetings and societies of the 18th century. But, as Clay Christensen would ask, can mainline churches adopt these disruptive forms within their own structures? A provocative experiment currently underway in Great Britain is the Fresh Expressions movement. Initiated by the Church of England and endorsed by the British Methodist Church, Fresh Expressions encourages and supports “new ways of being church” and of practicing Christianity in non-church contexts such as surfing clubs, pubs, parenting groups and soccer leagues. Often, these “fresh expressions” are created by clergy alongside existing parish structures in what is termed a “mixed economy” of church. It is not yet clear how well mainline Protestant denominations will adapt to changing patterns of congregating. But many denominations are trying, creating new experiments of their own and blessing those that have arisen on the margins. Although an encouraging sign, such innovations are still more the exception than the rule. Leaders in mainline Protestantism need to shift our default mindsets beyond the stereotypical congregation to envision new ways of gathering as God’s people. We must explore the many ways in which this disruptive innovation can be a force for renewal, a sign of the Spirit’s fresh wind blowing to offer revival and renewal for the church.